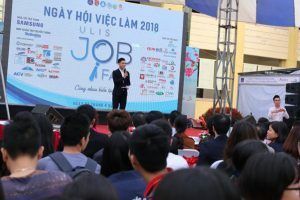 On April 6th, 2018, the University of Languages and International Studies – Vietnam National University, Hanoi (ULIS – VNU) organized its 2018 Job Fair at the building A1 and A2. The event was attended by Assoc. 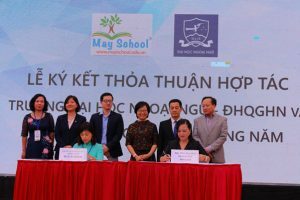 Prof. Dr. Ngo Minh Thuy, ULIS’s Vice President organizers, representatives from ULIS departments, Hanoi Youth Union, member universities of VNU, partner universities and especially 48 companies as well as students with great attention to the event. 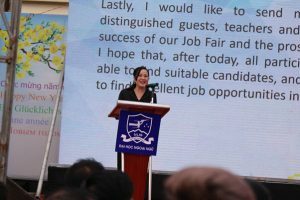 Addressing at the event, Vice President Ngo Minh Thuy extended her gratitude to the agencies and enterprises who have accompanied with ULIS over the past many years, especially 48 enterprises cooperating with the university to prepare for ULIS’s 2018 Job Fair. 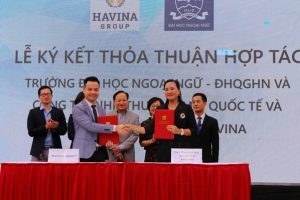 The university desired to receive the continued support and cooperation from companies in the next Job Fairs and student support activities as well as partnership between ULIS and enterprises. This will help ULIS to catch up timely and practically with the needs of society and the recruiter’s criteria for human resources, thereby improving the quality and applicability of training programs, which will contribute to the elevated quality of human resources for the development of society. “As a university, we are always aware of the importance of connecting students with employers. The Job Fair, one of those connecting activities, is thus held annually. It is an occasion for students to meet employers, gain more knowledge about agencies, companies and the needs of society and showcase their own abilities, experience and future career orientations. Also through the Job Fair, many students have found opportunities for internships. Many senior students can even find suitable jobs for themselves”, affirmed the Vice President. 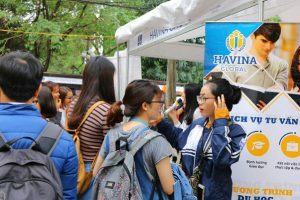 In ULIS’s 2018 Job Fair, ULIS officially collaborated with two new partners, Mayschool and Havina Group. Resuming the last year’s success, the fair this year offered 800 posts with 1000 employees needed in various fields including personnel, translation & interpretation, administration, travel, press-media, accounting-auditing, marketing, business management, teaching assistants, lecturers, etc. 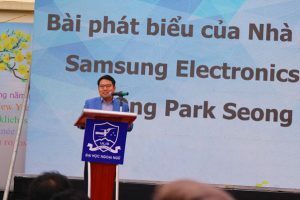 Many corporations in diverse fields joined the fair such as Samsung, FPT Software, Easia Travel, California Management Group, Honda Vietnam, Vietnam Airlines, Regina Miracle International Vietnam, Tokushin Group, Vinschool, Havina Group, which provided ULIS students with opportunities to find a dreaming job. 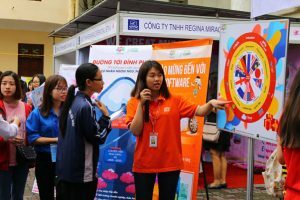 At the booths of enterprises, a wide range of activities took place continuously such as employer introduction, job description, product showcase and onsite interview in order for students to seek jobs. Talk show “Foreign language students and the non-smoke industry” and talk shows of enterprises provided wide knowledge and vital skills for students before they step into the real labor market. News & Events Hannah Pautler – USA: I hope to keep in contact with ULIS students when I return home.